For 2018, the Kia Forte adds cruise control to the LX sedan. The LX sedans's Popular Package now includes Android Auto and Apple CarPlay, while the EX sedan's Technology Package now includes a sunroof and the LX hatchback's adds a leather-wrapped steering-wheel and LED taillights. 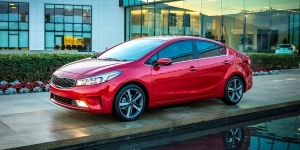 Get the best price for the Kia Forte of your choice from a dealer in your area. Request a price quote now.